On the Windows platform there is a memory wall that many people are experiencing. Namely, that Windows does not utilize all of your physical memory once you have 4GB or more of RAM, unless you are using Windows XP 64-bit or Vista 64. Instead of letting that extra memory go to waste, I thought why not utilize it in some other way. A long time ago we had the opposite problem with computers, where processors were slow and we tried to speed things up in any way possible. Today, we have a lot of processing power and abundant memory and now it is the software that needs to catch up to the hardware. Given this, I thought why not use a some of that extra memory and load it as a RAM disk. Then if you think about it, the most often used application in today’s computing is the web browser, which uses your hard drive to cache content. This sounds like a perfect opportunity to use a RAM disk and speed up your browser’s disk caching. IE and Firefox both make it easy to modify your disk cache directory too, so the biggest problem seems to be trying to setup the RAM disk in Windows. There are multiple commercial solutions, but only one free solution that I could find that works well. First thing to do is setup the RAM disk. If you do not want to purchase a commercial RAM disk driver, you can implement this free RAM disk driver for Windows Vista, XP, 2000 and 2003 Server. You will want to have a RAM disk that is slightly larger than both IE and Firefox disk cache sizes put together. Once you have both settings, close out of Firefox and start it back up again. Click the Move Folder… button to select a folder on your RAM Disk. If you used the free RAM Disk, your RAM disk should have a TEMP folder at the root, just choose this folder. Depending on your computer, your experience may vary. On my Windows laptop and desktop, the speed with which Firefox 3.5 launches is vastly improved. I do not use IE much, so it is hard for me to evaluate the differences there. 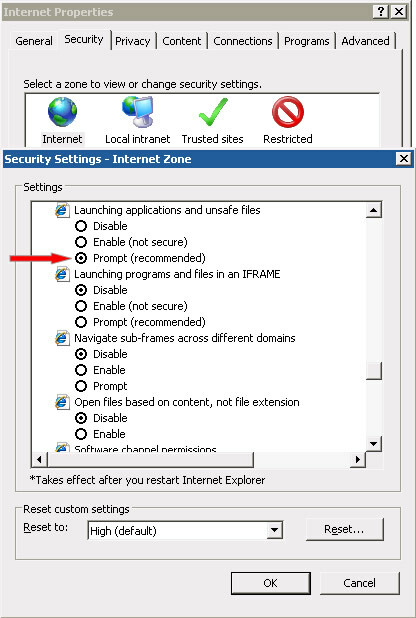 If you installed Firefox 3 and are using Windows, you might run into a problem where Firefox does not allow you to download exe files from the Internet due to a Windows setting. You will get the message: This download has been blocked by your Security Zone Policy and your download file will never download. To fix this problem you must modify Internet Explorer settings! Choose Tools menu – Internet Options. Click the Security tab and click on the Internet icon. Then click Custom Level… and navigate to Miscellaneous. Under this section find the option: Launching applications and unsafe files. Change it from Disable to Prompt (Recommended). Click OK, Apply, then OK.
Startup Firefox again and test it to see if it works now. Click on Tools – Internet Options. Click on the Sites button and verify that the website URL is in the list of trusted sites. Locate the Automatic prompting for file downloads sub-category immediately under the Downloads category. Set the radial button to Enable. Locate the File download sub-category immediately under the Downloads category and set the radial button to Enable. Click OK to save the changes and Yes when prompted to confirm the changes. Although I like to say that Safari is my favorite browser, my actual default browser for most of the day is Firefox and not Safari. My work day consists of working mostly with Firefox and IE 6. I haven’t gotten around to even working much with IE 7 at all. Luckily Firefox is very adaptable and I’ve managed to piece together a very nice setup of Firefox. It’s not quite perfect, but it is better than IE, and while I do like Safari, one of my pet peeves with it, is that it does not have as many add on features as Firefox. It’s greatest sin though is that the basic setup of Safari does not even have tab browsing enabled! My favorite add-on to Firefox has to be adding a new theme. While the choices in add-on themes seems almost infinite nowadays, I still think that very few themes actually improve on the default Firefox 2.0 theme. I usually switch between Saferfox and Qute. Of late though I’ve chosen a modified version of Qute, named BlueQute. Somehow, when it comes to computers, other than gray, blue seems to be the most pleasant of neutral colors. If you search for Qute on Mozilla’s Addons site you should find a couple of versions. Qute versions look equally well on Mac OS X, as they do on Windows, so if you work on both systems, it is kind of nice to have one browser look the same across multiple platforms.